CatMaster Tackle Halibut Boilie-Pellet 3KG Bucket "Shelf Life"
CatMaster Tackle "Catfish Morsels" are a handmade Pop Up made to our specific requirements. Great for using with a bed of pellets or just on thier own. CatMaster Tackle "Mackerel" Boilies are a frozen handmade boilie made to our specific requirements. Created with the highest quality ingredients. Which can be taken in and out of the freezer. 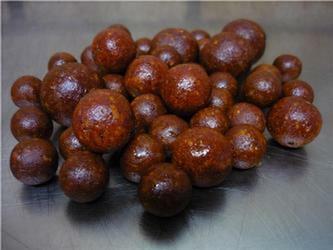 CatMaster Tackle "Squid" Boilies are a frozen handmade boilie made to our specific requirements. Highly attractive catfish boilie. Thanks to it huge diamentions the boilie is highly distinctive and stays on the rig for long periods over 48 hours. Made with strong smelling ingredients attracting catfish to the bait from great distances. The aroma has been optimised during prelonged testing by the Black Cat team. 3 kilo of 50mm Boilies supplied in a resealble bucket. A matching dip for the Black Cat Chunks, with aromas of blood, meat & liver purfect for giving Black Cat Chunks, pellets or pastes an additonal boost. The Mega Boilie, especially designed for Catfish. Made of a mixture of several liver & blood meals in conjunction with fish extracts. It attracts the giant predators over huge distances. The catches will suprise you.